Earlier this summer when I found out the Lying Game was being made into a ABC Family show jut like the author's other series, Pretty Little Liars, I squealed with glee. And while I didn't finish the book before the show started it got me going on it. For anyone else that has read the first 8 books in the Pretty Little Liars series there is a sort of funny connection (I think) between this series and that one, anyone else notice that? Anyhow onto the story... this is another mystery that involves a set of twins, one living and one dead (?) whom both narrate. The living twin, Emma ends up taking over her sister's life and tries to figure out what happened to her sister Sutton, who is basically a ghost who has no memory of what happened to her. This first book in the series is very much a set up for the whole series (Just like the first PLL book) so not a ton is revealed or really happens for that matter but I'm really excited to see where it goes. 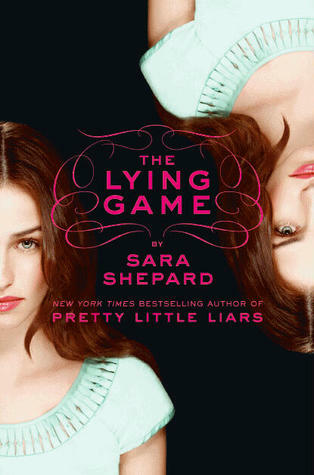 I love the whole concept of the Lying Game, which is actually a game and I hope we get to learn more about that in the upcoming books. And if you are interested I would definitely suggest the tv show, right now I think I might like that a little more than the book but of course everything happens faster on tv! ;P As it stands now the show is a little different than the book but we'll see how it plays out! Got copies from several places! Twins seem to be hot right now! This book does sound like fun. The book series is pretty good! But the show is NOTHING like the books! It's disappointing I think! They changed way too much! I actually enjoyed the book more than I'm enjoying the show. But still, I'm liking the show enough to keep DVRing and watching when time allows. It seems like the big hit move, right now, to turn YA books into movies and t.v. shows. Not sure how they'll all add up but this one looks like a book to read for sure.